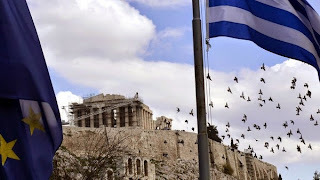 With Greece fast running out of cash, investors and policy makers have begun contemplating the possibility of a default and its consequences. The question they are asking is whether it is possible to keep Athens in the eurozone even if it failed to repay some of its creditors, thereby sparing the global economy renewed uncertainty. “Our base-case scenario remains that Greece and its international partners will reach an agreement,” wrote Reinhard Cluse, an economist at UBS, in a research note. “Nevertheless . . . the risk of failure and eventual Grexit [Greek exit from the currency bloc] should not be underestimated”. The cash position of the Greek government is extremely murky, making it hard to assess when exactly Athens might be forced to renege on its obligations. Silvia Merler, an economist at European think-tank Bruegel, has calculated that the government is running a better than expected primary surplus. However, this is largely the result of a severe squeeze on public spending, which is partly due to delayed supplier payments.